The "Order / Offer Form" represents and describes a deal between the organization and its clients, and includes details, payment method and terms, required products / services etc. This form in Hyper allows to execute advanced processes and activities, including the production chain, Production Planning & Control, bookkeeping, products pricing, creating new related tasks, defining payment conditions and terms, updating discounts etc. The information fields at the top of this window displays the Order Number, Agency, Client Full Name, Order's Type, status and Total Charge. These fields are automatically modified according to the modifications and updates made in the Order Form fields (Additional information fields can be added according to the user's requirements and needs). Order Title - This is the main tab where the general information about the order is displayed and can be modified (according to authorizations), as described below. Order Items - This tab is used to select and add the required products / services to the Order / Offer Form. For further information click here. Confirmation Chain (available according to the System Fundamentals definitions) - required activities for ordering process. For further information click here. For Office Use - Details and terms for inner use of the organization. For further information click here. Production - This sub-tab presents all of the required items and parts for the production. For further information click here. Modifications Log - This table presents all of the modifications made in this order. For further information click here. At the bottom of this tab there are few action buttons that will be described below. Subject The Order Title. This title will be used to identify this order. Order Header / Footer These are remarks / comments that will be displayed on the order form at the top of the form / under the items table. This offer is Valid for # Days Defines the validity for the price offer. after the defined date, this price offer will be automatically Canceled. Cash - Cash payment for the received goods. Standard Credit - Credit payment. Fill in the "Credit Months" and "Credit Days" with the required values. Extra Credit - The client will pay at the beginning of the following month or according to the added months/days in the "Credit Months" and "Credit Days" fields. 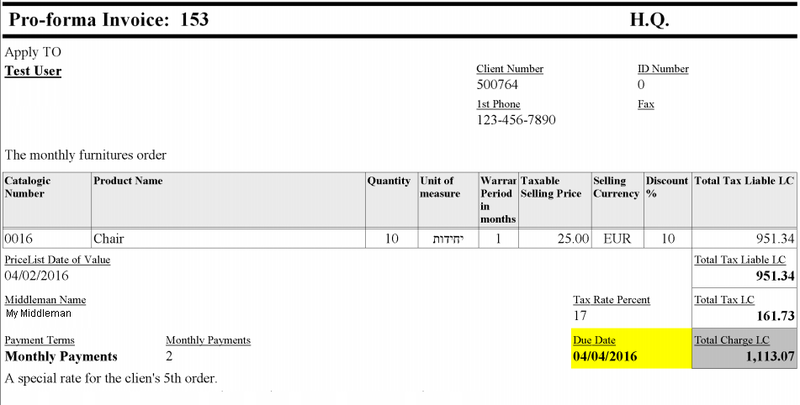 Monthly Payment - Monthly payments according to the amount of payments that will be defined when creating the Tax Invoice for this order. Consignation - The client pays only after selling this order's items. Please Note - This order will not be added to the expected income reports. None - No default payment terms. Please Note - This order will not be added to the expected income reports. Product Return Policy - This policy is defined in the "Agencies" tab of the System Fundamentals ("Default Product Return Policy" field). For an international order, the policy is defined in the "Global & Basic Settings" tab of the System Fundamentals ("Default International Product Return Policy" field). Print Order This is the order formal document that includes all of the order's details. The user can save this document as PDF file, print it or send it by Email. Open Tasks Display all of the related open tasks. New Task Create a new task, related to this client. For further information click here. Create New - Attach a file from the Docs Templates table. The docs templates can be added in the "Attachments & Templates" tab of the "System Fundamentals". Attach File from Local Disk - Select a file to attach, from the local disk. Opens the Change Order Status window. Copy this order details into a new price offer. The system will ask the user to approve this action. Create a new Order / Offer Form with the same Order Number and with additional version number (e.g. 130.01). Both of the orders can be modified separately. Cancel all of the discounts in this order. Define a discount for the total charge of this order. Set Final Price for the Whole Order. Set a final price instead of the current final price. Reapply the Customer Club terms for this order. Remove the Customer Club terms for this order. Import the "Order Header" and "Order Footer" from the "Orders Header & Footer" tab of the System Fundamentals, according to the chosen Friendly Title. 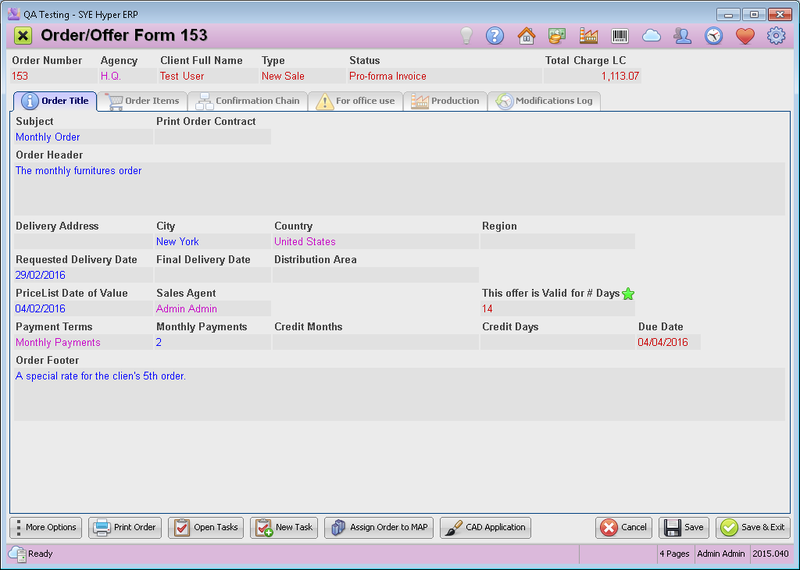 The Order Header will be displayed in the above the Items table and the Order Footer will be displayed under this table. Also, this action will import any attached file of this "Header and Footer" template (as was defined in the System Fundamentals). Client's details - Identifying information and contact details. Products details - Catalog number, Quantity, Unit of Measure, Selling Price, Currency, Tax. Payment Terms - Payment method, Monthly payments, Credit Months / Days, Due Date. Order Header & Order Footer - The required notes, as were defined in the "Order Title" tab and in the System Fundamentals. Product Return Policy - The product return policy, as was defined in the "Agencies" tab of the System Fundamentals (for any local order). For an international document, this policy will be defined in the "Global & Basic Settings" tab of the System Fundamentals. By using the Print Order button, the user can open a preview of the order form. By using the Fields Rules option, the system administrator can define a list of common subjects for the orders, that can be selected by the user when creating a new order. In order to create a new product to Hyper or add a product to the Products Catalog, go to the Product Design Module. A contract can be attached to an order, by choosing the "Import Header & Footer" option from the More Options menu In the Order / Offer Form. This contract can be added to the selected "Header & Footer" template, by using the Attach Contract from Scanner / Virtual Printing button in the "Orders Header & Footer" tab of the System Fundamentals.